For the third year in a row, I have had the pleasure of running a Fall community writing workshop at the Jewish Community Center in Albany. Some of the members have been together for all three years and have delighted the rest of us with their vivid writing. Poet and memoir writer Ruth Dorothy Pottinger of Albany, New York is one of those participants who consistently addresses her readers with incredibly fresh, tangible detail, often from her childhood in Jamaica. This excerpt is in response to the prompt, write about your most memorable meal. The butcher shop on St. John’s Road a few blocks from our house in Jamaica was open on Fridays. That was the day everyone got their fresh meat to make soup. Or those who could afford the expense bought different cuts of meat to make dinner for Friday, Saturday and Sunday meals. 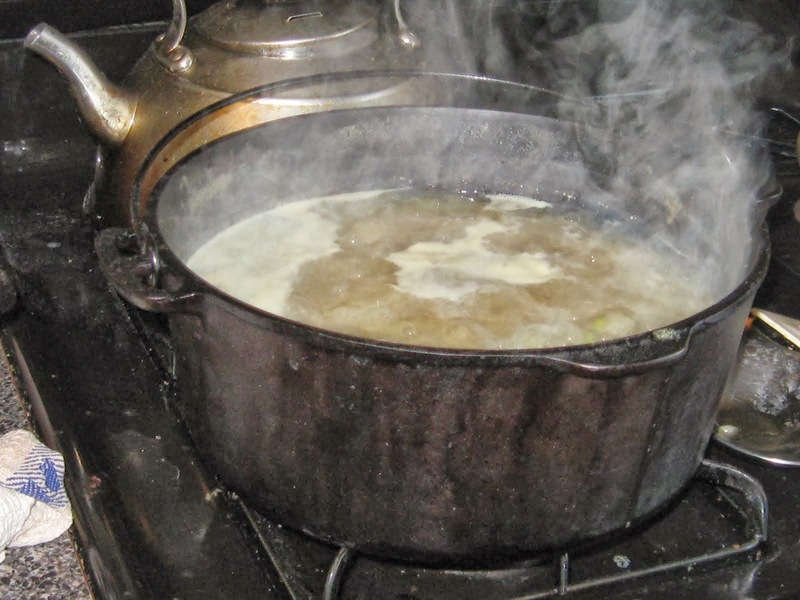 I really cannot picture my Saturday and Sunday dinner but Friday evening soup made with “goose-neck,” the part of the cow’s leg with the ligaments attached, was delicious. Do you remember Stone Soup? That’s the story of the man reputed to have made soup from a stone but really made it from all the soup ingredients he had requested from the villagers. Well, my mother’s Friday night evening soup was like that. She went to the food market in the morning where she purchased yellow yam, pumpkin, cho-cho, cocoa, breadfruit, escallion, thyme, green Scotch Bonnet peppers, and then to the grocery shop to buy flour. Soup was never the best without flour dumplings. I could smell my mother’s soup cooking in the large three-legged iron pot sitting on the iron stove as soon as I entered the gate. I would salivate in anticipation of the bowl of soup with my favorite food but mostly the bone with the gummy sinews which I would spend time digging into with my teeth to get every inch of meat and sinew off. We often wished we could have seconds but this was not forthcoming since we were so many and everybody loved the soup. No one was willing to share. No one was willing to give up any of the portion they received. We all were engrossed in the eating activity. Soup dripped down our chins but we ignored that until we had eaten every bit of the soup in our bowls. I wish I could have a bowl of that special soup today. I have tried making it, but I have been unsuccessful and have to relish the memory of the taste as I think about my mother’s bowl of beef soup on Fridays.